Lindsay has been the Owner & Director of All That Dance since it opened in 2001. She has danced since the age of 4 and holds a Bachelor’s Degree in dance from Ball State University. She’s performed in various theatre shows including Guys & Dolls, Crazy For You, Sophisticated Ladies, West Side Story and Big. She has choreographed for several musicals and show choirs including Monmouth/Roseville Show Choir, Choral Dynamics & Avon High School. 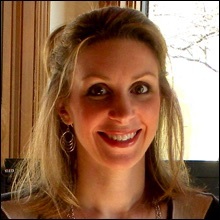 Lindsay taught for the Carl Sandburg College’s Kids On Campus program when it began in 2003 until it ended in 2016. In her spare time, she enjoys running, watching the St. Louis Cardinals and the Dallas Cowboys and shooting fireworks on the 4th of July. She’s also a Team Beachbody Coach and loves to go geocaching! FAVORITE QUOTE: "At the end of the day, it's about doing what you love." and "If it's the last dance, dance backwards." FUN FACT: I have my IL state explosives license to shoot fireworks and have done so since I was 18. I also have my OSFM license to purchase and shoot my own fireworks shows! Although Olivia has only been with ATD a short time, she has been dancing for six years. 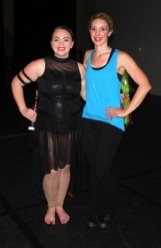 She has proven her passion is dance and has loved sharing her knowledge with fellow students. Olivia is a freshman at Carl Sandburg College where she runs cross country & track. She's also a former member of our Blue Heat team! Olivia loves math and has won first place in a geometry math competition! She hopes to continue to pursue a law degree in college. We're so fortunate to have her still choreographing for Blue Heat! FUN FACT: I'm obessesed with the band Queen and I love watching YouTube! Sarah is a United HS graduate where she is ranked in the top 10! Sarah has been dancing since the age of four and has taken classes in tap, jazz, lyrical and ballet. She's was drum major and a varsity member of her HS Scholastic Bowl team and chamber choir. She was also a member of our Blue Heat competition team and will serve as a guest choreographer. Sarah plans to study music education at North Central college in Naperville. FUN FACT: I play clarinet, piano and some trumpet and guitar. I LOVE reading!!! Harry Potter and Hunger Games are two of my many favorites. This summer I rode in planes, trains, cars, boats AND hot air balloons! I saw 2 oceans, 2 continents, and a sea! Jessica has been an ATD student since she was in grade school. She has taken class in tap, jazz, ballet, pointe and lyrical but ballet and pointe are her true passion. She has been one of our teaching assistants (TNTs) since 7th grade and enjoys helping students succeed. Jessica graduated from GHS in 2017 and is currently attending Carl Sandburg College pursuing nursing. She was a member of our Blue Heat team for 3 years. Jessica loves dancing and painting and is excited to pursue a dance career after transferring from CSC. We're lucky to have her on staff! FAVORITE QUOTE: "Some dance to remember, some dance to forget." FUN FACT: Jessica was our 2017 Dancer of the Year! 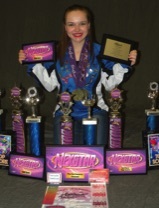 Kyndal has been dancing for the past 13 years in all styles of dance. She was a 2yr member of the GHS Gadet dance team and is an active member of our Blue Heat dance team. Kyndal has been a teaching assistant (TNT) for 4 years and loves teaching! She is a senior at Galesburg High School and will graduate in December. Kyndal loves anything creative including painting, makeup, art & dance! She plans to attend Carl Sandburg College after graduation. We're thrilled to add her to our staff! FUN FACT: I was named Dancer of the Year in 2016 on my 16th birthday!